I am currently going through your course "Better Business Writing in English". In this course, I am at the first practice quiz in sentence types. The first 2 questions in this quiz seems to have a technical problem as any answer that I present from the options given returns a wrong/error. Could you please check and revert? 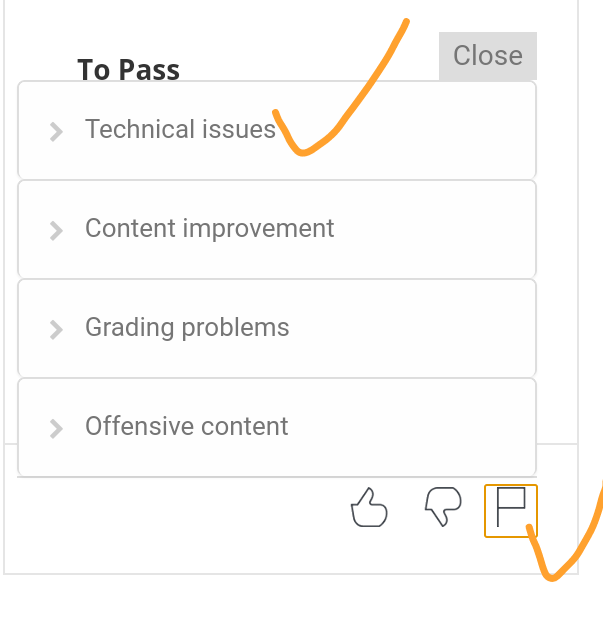 * clicking the "Flag" icon on the quiz page, selecting the "technical issues" option, and typing your message. * posting about the issue in the discussion forums of the course. The course staff or Mentors might monitor the forums. Please don't provide the details about the right answer in the forums. Just report that you think there is an issue. * contacting a Help Center agent. There is a "contact us" link on this Help Article which enables you to do that. Yes, I have reported the issue clicking on the flag as well.